As they prepare to hit the road again in their original 1982 lineup, Nitzer Ebb's Douglas McCarthy reflects on the long road that brought the EBM pioneers to where they are today. When a handful of teenagers strode on stage in London's Chelsea in 1982, propelled by their own "bloody-mindedness" yet half-paralyzed with stage fright and bewildering the sound techs with their lack of guitars, few probably predicted they would pioneer the genre of EBM (electronic body music) and still be going strong over three decades later. But then, nothing about Nitzer Ebb has been predictable. 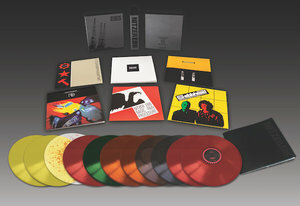 As the group prepares to release a ten-LP retrospective and hit the road again in their original formation (McCarthy along with Bon Harris, David Gooday and Simon Granger) with the newly reworked material, co-founder Douglas McCarthy reflects that Nitzer Ebb was driven by two key tendencies. On the one hand, the ambitious teens followed a mantra of "next step": each time they achieved one goal, they would set themselves a higher one (play their hometown; play London; release an album). Before they knew it, they were a signed band. On the other hand, once they were signed and releasing albums, they made each album a sort of reaction against the previous one, with the aim of avoiding predictability and pigeon-holing. "Whenever we made an album it was normally a reaction to the previous album, in terms of our personal growth and being relatively quick to be bored with it," he explains. "As soon as we finished [one album] ... we immediately went about, not trying to discredit the previous album, but for our own enjoyment create something very different." The band's iconoclastic approach to music-making and to challenging their own legend continues, remarkably, to the present day. Nitzer Ebb are often referred to as pioneers of the EBM genre. McCarthy laughs, acknowledging the technical validity of the statement, but notes that there was no coherent term or label for what they were doing when they started. When they began he recalls a music journalist describing them as "positive punk". "Punk had kind of died a death by 1978, 1979," he explains. "It had become pretty much a cliché, but there were bands, some of which had been part of the punk scene, like Siouxsie and the Banshees, Killing Joke, Bauhaus, who were having a big influence on us, in some ways stylistically but also in the energy that they gave." They had no interest in guitars, so they turned to synths and sequencers, along with the use of live drums. "There was a lot of angst and energy that was still prevalent from punk, and then what became positive punk," he says. When they toured in Canada and the United States, they found themselves lumped under the label of alternative rock, by the college radio stations that were playing them there. It wasn't until the release of their second album, Belief, that the label EBM began to be applied to bands like themselves, Front 242, Ministry, and others. If anything, he says, the band resisted and rebelled against the labels that others tried to place upon them. "When you're younger, especially, I think you pretty much bully yourself all the time," McCarthy reflects. "So we kicked against it as a definition of what we sounded like. Partly because we felt that we were beyond one characteristic label. In some ways it was one of the inspirations why we made such wildly different albums in terms of direction -- we were always being labeled or pigeonholed." To watch one of Nitzer Ebb's early videos -- "Murderous", say, or "Join in the Chant" -- is to be left breathless at the angry passion and sheer physicality of the energy expressed on the camera. Ironically, McCarthy explains, the frenzied body movements and violent passion expressed by the band, and especially by McCarthy himself, was a reaction against the stage fright he felt when they first began performing. He was only 15 at the time. "We'd rehearsed for a full year, and were very intense about making it the best show that ever happened," he recounts. "I was planted onto the stage in one position just fearfully holding on to the mic stand. And it pissed me off so much, that I had been paralyzed by fear. I mean I performed -- I sang fine -- but I just couldn't find the confidence to move. So I decided that by the next show that the only way I could do it was by just abandoning all self-consciousness and just going a bit mental. That paved the way for how Bon [Harris] and I performed from there on in ... there was an element of wanting to be shocking, and there was an element of trying to overcome the initial stage fright of performing in front of people." Awed teens and pre-teens who grew up listening to them -- yes, I was one -- were quick to zero in on the angry, even violent anti-authoritarianism of their lyrics, which was amplified by the sheer intensity of the music. McCarthy acknowledges that was part of their intent, but says the source of their dissent was much broader than just politics. "This is the thing -- we were teenagers when we started the band. And we were still anti-authoritarian, but the authority that we were anti wasn't just necessarily governmental or high school teachers, but it was also the complacency as far as we saw it of the music scene, specifically in the UK. It was very much rock-orientated. It was a time of either very insipid pop music or very overblown rock. And the macho-ness of it all was something that we kicked against. "When we did the first shows quite often for at least the first couple of years when we were first performing, we didn't have our own sound guy at that point, so we would turn up at these essentially rock venues, and they just were absolutely confused about where the rest of the band was. And they would mix the sequencer really low in the mix because they were expecting a bass player and a guitarist to come along. We were like no, that's it. So there was a lot of kicking against the norms as well as the authority figures." Talk of the music industry still generates a sardonic disgust from the veteran musician, although his anger is more controlled and analytical than perhaps it was in the early days. Yet he's quick to list off a score of ways in which the industry has made life worse for musicians over the years; changes he's witnessed first-hand. There was, for instance, the advent of online music and downloading sites such as Napster. "The record companies, certainly in the US, completely screwed it up," McCarthy says. "They thought that they could control it and then it became what it eventually became. There were some rough years when music was just being downloaded, and the record companies had taken advantage of the record-buying public and the CD-buying public. "The advent of CDs itself was the biggest con that they ever did, by having a product that cost pennies instead of dollars to manufacture, but charging two or three times as much for it, that being the idiot move that the industry did." Not only the industry has changed over the past three and a half decades, though. The way music is made has been subtly changing as well. From a production perspective, he's noticed a shift in how bands use studios, for instance. When Nitzer Ebb started out, he says, bands would rent thoroughly equipped studios at very expensive rates, and rarely use all the instruments and technical resources the studio had to offer. These days, he says, bands book studios much more sporadically and with specialized purposes in mind -- recording drums for a day, say. The consequences of this have been double-edged, he feels. On the one hand, technological advances have made it much more accessible for the broad public to produce music. "On the flip side of that, it's become even easier for people to be relatively lazy about the sounds that they're using, and the production style that they're using." Another big shift for bands like themselves, he says, has been in the experience of touring. "It used to be a relatively healthy thing for young bands to get out on the road," McCarthy continues. "You wouldn't actually become extremely wealthy from it, but you could manage. You could pay for the tour and you could actually live off it. And I think, certainly in North America, that is very much a bygone statement. People talk about the wealth gap or the poverty gap in greater society -- I think that's even more acute in the music industry. "You've got bands that are working bands -- and I'd probably put Nitzer Ebb in that category, we're lucky enough to be a legacy band, and we can draw on people who grew up listening to us and are excited to see us play live, so we do pretty well -- but then there's a massive gap between bands like ourselves and the multi-multi-millionaires. There's always been something of that sort, but there seems to be a real dearth of bands in between the middle part and the top part." Looking back on over 30 years of producing and performing music, McCarthy feels one of the band's key contributions musically has been showing that it's possible to produce tremendously high-quality music while retaining simplicity in the musicians' approach. "The simplicity, the fact that you don't have to complicate things too much," he notes, when asked about the band's musical legacy. "In the very beginning -- just out of necessity -- we only had one synthesizer, a Roland SH-101 which had a sequencer in it. The most complicated it got was when we brought two SH-101's. "We would build songs up and add quite a lot of layers and a lot of effects to it, and then once it felt like it was a song we were happy with, then we'd go about deconstructing it and take out anything that was unnecessary," McCarthy continues. "I think that that approach to production was probably a lasting effect. I'm told quite often by other musicians and producers, and also fans and journalists, that when listening to 30-year-old songs by us, they still sound current and the production sounds current, and the actual approach to the music-making still sounds current. And I think that's because of the minimalist approach that we took in production style." Reflecting on the albums, he's loath to single out any one as a favorite: they each have their merits, in his recollection. 1991's Ebbhead, featuring Alan Wilder from Depeche Mode, was probably the most rounded and overall successful album, he feels. But he has a special fondness for the band's second album, Belief (1989). Recorded hot on the heels of their debut That Total Age (1987), they produced it while suffering from a musical version of imposter syndrome, he recalls. "When we were making Belief there'd been a kind of tumultuous time of splitting up from initial management and publishing company, and there were some personnel changes in the band," McCarthy recalls. "We were slightly terrified that we were going to get found out, and then all of this was going to stop, Mute [Records] would stop paying the bills, and we'd be out on our rear. "So we would work ridiculously hard. The couple of months that we were waiting for [producer] Flood to be able to work with us, Bon [Harris] and I would work 15-hour days, seven days a week. We'd just be in the studio every day until early hours of the morning, get up -- we were living in an apartment together -- we'd go home, crash, get up, go straight to the studio again. Because, one, we wanted to get the feeling out of us, and it was more complicated than we'd imagined to get all of the feeling out of us, you know that tricky second album problem that people have. But, two, it was like this worry that we weren't going to achieve what we were trying to achieve by the second album. So that album has a lot of specialness to it for me." Do they harbor any regrets, anything they would do differently when reflecting on things? "There are a few wardrobe regrets, yeah, a couple of hairstyles," McCarthy laughs. But then he grows reflective. "We were fairly strong-minded and fairly arrogant a lot of the time. And I think that sometimes the strong-mindedness tips over into being just arrogant little shits. There's definitely some people that got the short end of that stick, the pointy end of that stick." He also recalls, with a wry laugh, that they rejected an offer to tour with David Bowie. Bowie was doing his Glass Spider Tour, and they'd had friends who had been on the tour who had hated the experience. It was a very technically complex and overblown show which wasn't selling well, and this created a lot of problems for the bands on tour, he recalls. "It was an in-between time for us, as to whether we were going to go on the road again or go into the studio, and we decided to go into the studio. So you know, maybe in retrospect it would have been nice to tour with Bowie, but again we didn't like the album. We thought it was a bad tour. It's just that he's obviously an iconic character, and always has been for us, but that didn't get in the way of our bloody-mindedness," he laughs. For several years McCarthy parted ways with producing music, at least as a career. By the end of the 1990s, Harris had moved to Chicago, and McCarthy was still living in Detroit, playing music and considering starting a new band. But then he decided to go back to school instead. McCarthy returned to England and enrolled in university to study film and design. He eventually wound up building a second career in advertising. "I was really glad to get away and do something different, to be honest," he says. "I decided that I didn't really want to do music, for a while. I needed a big break from it. It's not necessarily the music part of it -- it's the industry part of it, and then the personalities of being in a band. As any band that continues to work together over a number of years will tell you, it's a very big commitment emotionally and psychologically, and creatively. You wind up coming to blows over pretty much all of the above. I guess the most similar thing I can relate it to is a long-term relationship or marriage, where you start to become so self-aware of what can piss the other person off that it's really easy to do it, even sometimes when you're not meaning to. So we needed to take a break." Yet music wasn't so ready to let him go. In the early 2000s, while cultivating his new career, he also began producing music as Fixmer/McCarthy, collaborating with the techno musician Terence Fixmer. He's produced solo material, music for his wife's film projects, and provided musical contributions for such bands as Die Krupps and Recoil. And last year, he hit the stage with a powerful team of collaborators known collectively as Black Line. The Black Line collective, which has been described as an "EBM all-star band", produces a sort of aggressive electronic rock that bears a clear kinship to Nitzer Ebb. It also features Bon Harris along with producer Cyrusrex. Other collaborators have included Paul Barker (Ministry), Mark Walk (Skinny Puppy), Christian Eigner (Depeche Mode), Ken Marshall, and others. In addition to showing the veteran artists' musical skills and stage performance are as sharp as ever, the 'supergroup' also reveals a still-vigorous anti-authoritarianism. Black Line's first album, released last year, was titled Treason, Sedition and Subversive Activities. The album features such songs as "Sedition", "Can't Breathe", and "Shut It Down". McCarthy described parts of it as his response to the lead-up to the U.S. election which propelled Donald Trump to power. The British-born musician now lives in Los Angeles and has witnessed America's recent political turmoil first-hand. I asked him whether he feels the Black Line message will reach people and have an impact. "I would have serious doubts," he says wryly. "It's become so polarized, that either you like a message or you don't like a message. There's no persuasion going on." Still, McCarthy is hopeful. For all the nascent aggression in his music, he evinces sage sobriety in his political analysis. He's torn on whether impeaching Trump would solve things, he says, because he fears that could just intensify the political divisions which are increasingly dividing Americans. "I think that things should try to be done through the polls, through voting," he says. "Even though it feels like we're pretty far away from a straightforward democracy, and heading further away from a straightforward democracy, I'm hoping that it will prevail and the constitution will prevail." Hearing such sage advice, you'd be tempted to think McCarthy and his colleagues have mellowed. Check out Black Line's music, and you'll quickly be absolved of any such delusions. Black Line is going to be McCarthy's main focus moving forward, he says. Still, he's looking forward to touring with the original Nitzer Ebb lineup, and to re-working the old material, which is what they're currently doing. While discussing all these musical projects -- Fixmer and McCarthy, Black Line, music for his wife's film projects -- I make the mistake of referring to them as "side-projects." It's a poor choice of wording on my part, and the reaction is swift and firm. "It's not a side-project for me, it feels on equal footing and certainly the amount of energy and effort that goes into [them] is just as much as was ever put into Nitzer Ebb," he interjects, noting that he puts the same amount of effort into requests he receives to do guest vocals for other artists. "It's a hundred percent effort put in." Partly for that reason, he says, he prefers not to single out any individual project as a favorite. "I love them all." And so, I'm sure, do the fans they continue to gather, more than 35 years after a gaggle of bloody-minded, stage-frightened 15-year olds took to a stage in distant Essex.